Cato Neimoidia, a key world of the Confederacy of Independent Systems and the Neimoidians who manage the Trade Federation, is one of the wealthiest worlds in the galaxy. Its polished skylines are suspended upon gently swaying bridges, feats of architectural wonder spanning the fog-shrouded valleys of the mountainous world. As an ancient space faring species, the Neimoidians have colonized hundreds of worlds. 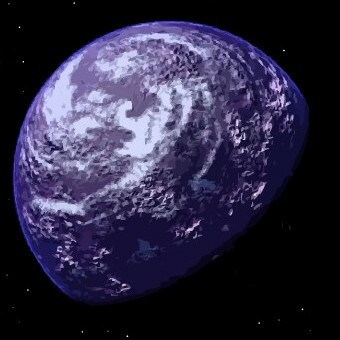 Such planets became the basis of their riches, as the aggregate resources of their colonial holdings funneled back to their home world of Neimoidia. The most prestigious of the colonies were the so-called purse worlds. These were not simply resource-rich planets of to be strip-mined and exploited -- they served as administrative posts, managing their own set of colonies. They also served as repositories of the harvested resources. They alone were allowed to carry the name of Neimoidia. Among the most famous of purse worlds were Cato Neimoidia, Koru Neimoidia and Deko Neimoidia. Cato Neimoidia is the eldest of the purse worlds. It is also, perhaps, the most exclusive. Only the richest of a very wealthy culture live here, protecting their troves in subterranean vaults guarded by difficult landscapes and seemingly endless battle droids. Not wanting to live too far from the vaults, yet not trusting anyone to get too close to them, the Neimoidians instead built bridge cities suspended above the foggy grottos that led to their treasures. marred by anti-starfighter emplacements. Even the private redoubt of Viceroy Nute Gunray was bolstered by upgraded defenses as the Neimoidians cowered at the notion of possible attack. The terrifying possibility became reality as the Republic breached the orbital defenses of the purse worlds and began a concentrated strike against the Neimoidian holdings. A month before the Battle of Coruscant, Obi-Wan Kenobi, Anakin Skywalker, and Clone Commander Cody led their forces on a notoriously botched mission against the planet in an effort to capture Viceroy Gunray. Gunray escaped, but the Jedi were able to seize his mechno-chair that contained the coded holographic transmitter through which the Viceroy contacted Darth Sidious. This gave the Jedi valuable proof as to the Dark Lord's existence. Despite their mission missteps, the Republic was ultimately victorious on Cato Neimoidia, securing the world, if ever so tenuously. Pockets of resistance continued to flourish in scattered bridge cities, resulting in regular Republic sorties to patrol and quell any uprisings.